Attach this Survivor Key Chain to your keys as a way to give the reminder of your hard work and will power to fight anything that comes your way. Our Cancer Survivor Key Chain Keepsake is an excellent way to show your courage and strength all while giving others the determination they may need to never give up hope. Our Cancer Survivor Key Chain is perfect for spreading awareness. 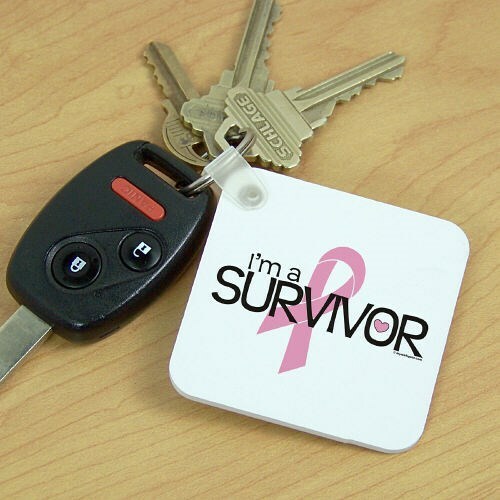 This Survivor Key Chain measures 2¼" x 2¼" and is 1/8" thick. Each Key Chain is made of fiber glass reinforced plastic and includes a key ring. Personalize your Survivor Key Ring with any ribbon color. Additional Info MyWalkGear.com is your home for inspiring & uplifting Cancer Survivor Apparel & Walk Gear. Be sure to also view this great design as our Cancer Survivor Sweatshirt & our Cancer Survivor Water Bottle as well.